Hazel Stead is currently running her own practice and also offers a mobile service. Hazel is based in North Yorkshire, England. 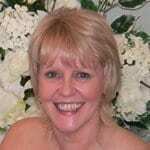 Hi, My name is Hazel Stead and I am based in Leeds, North Yorkshire. I became interested in Reflexology quite a few years ago. A friend invited me to an evening at the local village hall where a Reflexology demonstration was taking place. I was hooked, this fascinating art intrigued me. I admit I was a bit of a pest to the poor man who did the demo because I didn’t stop asking questions! I didn’t have the chance to go further with reflexology until two years ago. I enrolled myself on a reflexology course, gained my diploma, and have not looked back since. I have started my own business, although at the moment, I can only work at it evenings and weekends. I have been lucky enough to be able to rent a room, at a tanning/beauty salon, very close to where I live. I also work as a mobile therapist, going to visit people who cannot leave their homes for whatever reason. Since starting my business I have gained a diploma in Indian Head massage. I decided that I would like to study for a diploma in Aromatherapy. This is when I discovered The School of Natural Health Sciences (SNHS). I studied their website and found that I could work at my own pace, which was great, especially as I am holding down a full time job (manager of a day care centre) and starting my own business. The course content and support I received from my tutor George was fantastic. I have now gained my Aromatherapy diploma and I am now studying for the Indian Face massage diploma. I have had several very supportive friends who have been my “case studies” during my studying. Two of them are now paying customers and they have recommended me to their friends so, hopefully, I will be able to work more as a therapist running my own business than working for someone else. I would love to complete the Advanced Aromatherapy course and, who knows, that could be my next assignment! Thank you to you all at The School of Natural Health Sciences. Without you, I would not be having so much fun working at something I thoroughly enjoy.